Citation Information: J Clin Invest. 2007;117(4):862-865. https://doi.org/10.1172/JCI31750. HIF activity under hypoxic and normoxic conditions. 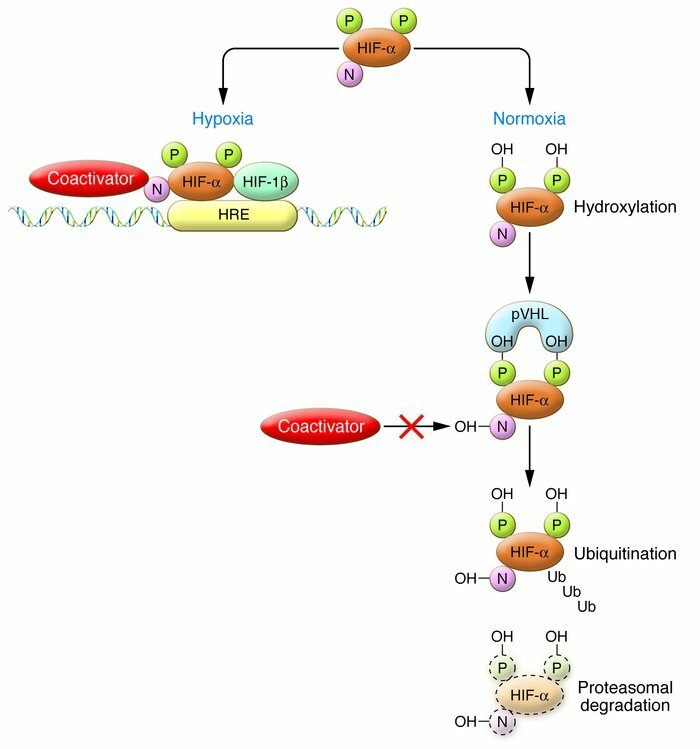 In normoxia, hydroxylation at 2 proline residues promotes HIF-α association with pVHL and HIF-α destruction via the ubiquitin/proteasome pathway, while hydroxylation of an asparagine residue blocks association with coactivators. In hypoxia, these processes are suppressed, allowing HIF-α subunits (both HIF-1α and HIF-2α) to escape proteolysis, dimerize with HIF-1β, recruit coactivators, and activate transcription via HREs. N, asparagine; P, proline; OH, hydroxyl group; Ub, ubiquitin.